These intimate adventures are designed to feel comfortable and safe while also connecting you deeply to the food, art, culture, history and spirituality of this ancient land. I aim to share the magic and adventure of the India I explore. This year I am collaborating with Mela and Touch of Spirit Tours. We have crafted these trips so that I may have the pleasure of introducing you to the places I love most. Why a trip to India may be for you. India has always been a magnet for travelers. She is a cocktail of culture, tradition, art, color, language, emotion, spirituality, magic, food, frangrances and history, mixed differently each trip, especially for you. The sun rises over the sacred Ganges river in Varanasi. She is the 5-star luxury converted palace hotel, and the simple thatched mud hut. The shiny shopping mall with bearded hipsters sipping cold brew coffee and the dusty bazaar street and its local chaiwalla, who has supplied the hundred year old shops with their sticky sweet fix. India is the packed, sweaty, rush-hour train snaking through the lush Bengali countryside and the luxury air conditioned Volvo bus climbing the noble and inviting mountains of Himachal. She is the beaches, parties, restaurants, and whitewashed churches of Goa. She is Rajasthan’s toppled palace ruins, each stone with its own story, of kings, queens, love, betrayal and canon balls fizzing through the dusty air. A roadside Stupa in the mountains of Ladakh. She is the lazy afternoon on a backwater houseboat in tranquil Kerala, and the tribal stone pulling festival of Christian Nagaland. She is Pondicherry’s French colonial buildings, Lutyen’s Delhi, Akbar’s abandoned capital, Mumbai’s stunning art inspired airport, the maze like stone alleys of Leh, the blue city, the pink city, and the blindingly white salt deserts of Kutch. To make any true sense of her, like the sweet taste of a freshly-picked, tree-ripened mango, India--the wisest of teachers, the greatest of lovers, the adventure of adventures--is to be experienced. She is the multicolored Gopuram towering over a glorious elephant festival, the minaret loudspeaker confidently calling Muslims to afternoon prayer, the cement monstrosity ashram complete with 60 foot cement deity-statue, and the intricately carved Jain temple, hidden down a small alley, up a narrow flight of stairs. She is the hip yoga studio in Rishikesh, the serene mountain hangout of Manali and Chennai’s chaotic train station platform. Elephants feast as their carer looks on, at a temple festival in Ernakulam, Kerala. What to expect from a trip to India with me. My personal goal is that every trip should leave you with a feeling of joy, gratitude, and a deeper understanding of this beautiful country, her people, art, and culture. But even more importantly, of yourself. It is the inner journey I focus on most, for that will continue long after the ending of our tour. Yamuna Arti ceremony at sunset in Vrindavan, Uttar Pradesh. As a westerner who has lived in and explored India for many of the years since my parents first brought me aged three, I am fluent in Hindi, India’s national language, and am passionate about sharing her with you. As a traveller and photographer, I practice seeing the beauty beyond her chaos. As a student I relish conversations that invite me deeper into her fascinating subtleties. As a wanderer I am addicted to the bittersweet feeling of exploring her unknowable past, ended and rebuilt over and over again. I love the exhilaration of discovery, the empathy that comes from understanding perfect strangers, and the inner evolution that these experiences spark when combined. On all my tours you can expect a fun and deeply rewarding adventure that is meticulous in caring for your comfort and safety. My goal is to prepare you to face the challenges of being in a foreign country, with its own ways, reasonings, and methods of dealing with modernity. You will learn to navigate the sensory overload as we are welcomed and tutored by this often contradictory culture. I will nudge you towards real people who live their traditions. You will hear their stories and share their world, if only for brief, warm, and magical moments. I will guide and equip you to graciously interact with all that India presents. That is where the magic lives. 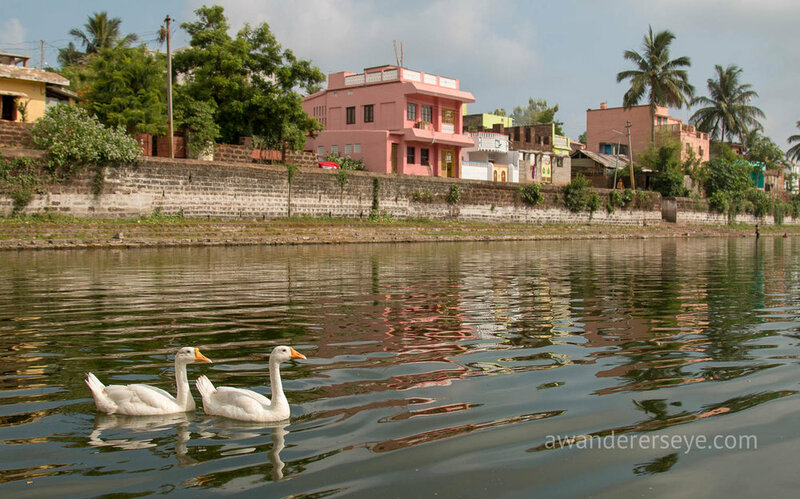 A neighborhood pond in Odisha.